Eastern parts of Oklahoma could experience flooding. The risk of storms across the state has decreased. “The massive storm system has delivered widespread rain and high winds across much of the state since Friday, with damage to power lines and power poles as well as trees, roofs and structures. In the Panhandle, more than 4 inches of snow has been reported in some areas,” said the release. The National Weather Service reported high winds on Saturday, reaching up to 80 miles per hour. The winds resulted in damage to trees, homes and other structures in the Oklahoma City metro area. Meanwhile, eastern Oklahoma experienced widespread flooding. Temperatures varied widely across the state on Saturday, with parts of the panhandle experiencing freezing weather, while the southeastern corner of the state reached temperatures as high as 81 degrees. The National Weather Service predicted continuing storms on Saturday, with slight risks of flooding and tornadoes in the southeastern part of the state. This post was updated at 4:42 p.m. on April 29, 2017. Previous version from 2:48 p.m. on April 28, 2017. It could be a windy and wet weekend. 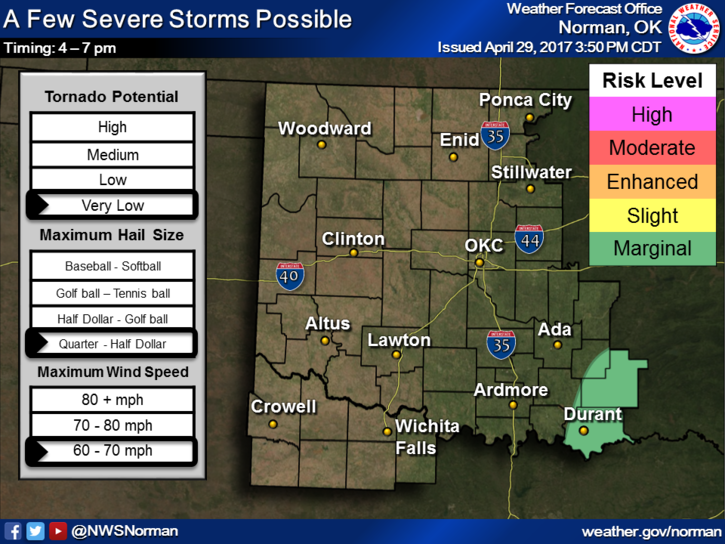 The National Weather Service forecasts a high likelihood of thunderstorms beginning on Friday around 7 p.m. in the southeastern part of the state and at 9 p.m. in central Oklahoma. The storms are likely to continue throughout the night. Winds may reach up to 70 miles per hour. There will be a very low risk of tornadoes, but hail the size of tennis balls is a possibility. “It’s looking more likely that large, damaging hail will be our primary concern as we move through the night hours,” said Jonathan Kurtz of the National Weather Service. Flooding may also be a concern. 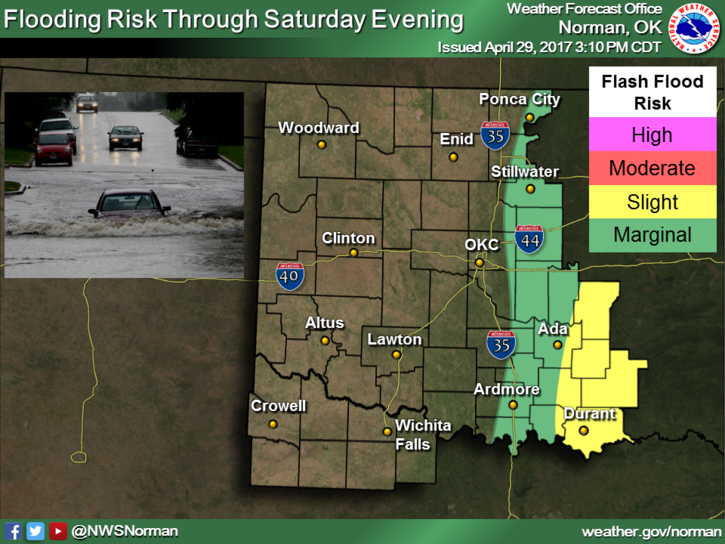 There is a moderate risk of flash floods in eastern Oklahoma, and a slight risk in the Oklahoma City metro area. To wrap up the weekend, there is a chance of light rain on Sunday morning, with cooler temperatures expected. The Oklahoma City area could see severe storms from Thursday night through Saturday. According to the National Weather Service, there is a marginal risk of thunderstorms in the northeast of the state on Thursday evening. On Friday, the likelihood of severe storms will increase and move east, covering the central, southern and eastern parts of the state. While the tornado risk is low, the maximum wind speed could be between 60 and 70 miles per hour, and there could be hail the size of tennis balls. The storms may continue on Saturday, moving southeast. Oklahoma residents in the central and eastern parts of the state should also be on the lookout for flash floods, according to the National Weather Service. In total, the Oklahoma City area could see up to three inches of rain this weekend, possibly interrupting the Norman Music Festival, which runs until Saturday, and the Oklahoma City Festival of the Arts, which runs until Sunday.